While much of the shooting world has opted to use a traditional red dot, they may be missing out on a better experience. While red dots are undoubtedly good, the best holographic sight has a few advantages over the best red dot. They tend to be easier to use, faster, and more versatile. With many traits in common, the distinction between these two types of sights can get confusing. Most people use the terms interchangeably and, for the most part, that isn’t incorrect. To get a better grasp of the situation, let's dive just a little deeper. The term red dot is not a specific type of sight but instead a blanket term for most sights that have little to no magnification and have an illuminated reticle. Even holographic sights are frequently lumped into red dots though this is incorrect. There are three types of sights that are lumped into the red dot category. The first are prism scopes that are the tube based red dots. Brands like Aimpoint have made these very popular and they are quite good sights. They work by using a lens to reflect the light of an LED that provides a simple dot reticle. Secondly are reflex sights which are smaller sights without a tube but still use a red dot as the reticle. Sometimes these are thought of as holo sights but if you want to be proper, they are not. Instead, they rely on reflected light off a lens for the reticle. These are used on pistols, rifles, and shotguns. True holo sights are very rare. Until recently, the only really ‘TRUE’ holo sight was Eotech who owns patent on the technology. 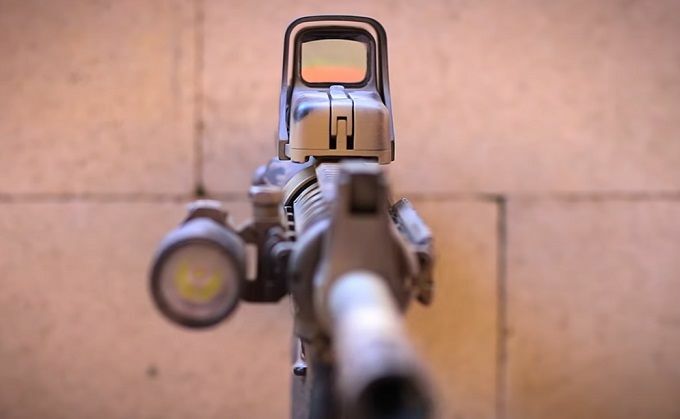 Recently Vortex developed a similar technology that allows them to produce a holo sight that is similar in function to the Eotech. Both work on the same principle of a reticle suspended between two layers of glass. The illumination highlights part of the reticle rather than using reflected light. They are often found on many tactical weapons and rarely on hunting rifles. Because true holo sights are rare, it would be a pointless article to talk about the best one. Instead, we are going to look at what are commonly thought of as holo sights and go with what makes them the best. While your iron sights will get you on target with reasonable speed if you practice, any red dot will get you on target faster. Your follow up shots will be faster as well. You have no need to align your front and rear irons, just put the dot on the target and squeeze the trigger. A holo sight improves on this speed by using a larger reticle that you can put on target even faster. Because the reticle can be more complex, they will often have a dot within a circle. The dot gets you finer accuracy when you need range while the large circle works perfectly for CQB. A holo sight is forgiving of how you shoot. Eye relief is always infinite so you can be as close or far away as you like. This is what makes the applicable for handgun use. Basically, if you can see the dot and put it on the target, your bullet will be on target. Compared to other options, getting a holo sight is rather simple. There aren’t as many factors to consider. The platform you intend to use the sight on will likely make more of a difference than anything else. That said, let’s take a close look at what you can expect from a holo sight. Size will be the first factor that comes into play when you start looking for the appropriate optic. If you plan on putting this on a rifle, any size may be ok or you might want a larger sight with more field of view. For pistol, you will need something small and lightweight. Larger sights have a lot of benefits. Usually, they are more durable but that is not universally the case. They will also use larger batteries and are often more efficient. This means they will run longer without the need to replace your power source. Weight is usually not an issue with holo sights. Most of them are lightweight, to begin with. For a smaller pistol or lightweight rifle, you may want to keep the weight down as much as possible. There are some holo sights that weigh less than 2 ounces but even the heaviest ones rarely break a pound. The biggest difference between a low cost and a high-cost optic is battery life. All holo sights run off of LEDs that are very energy efficient so battery life should always be in the hundreds of hours of use. Some of the best models can extend this well into the thousands of hours. There are features on some holo sights that will help improve your battery life. The most common is an auto-off timer that will turn the sight off, usually after an hour. It is very easy to forget to turn your sight off after use and this option can be a lifesaver! While most of the sights here are going to have a plain red dot, that isn’t necessarily a bad thing. The dot sight is simple and easy to use. Shooting speed will still improve over iron sights by a significant margin. For most people, this reticle will perform everything the will ever need. The rare sight has a reticle that may contain a circle or chevron and will usually have a dot as well. The larger reticle will greatly improve target acquisition at closer ranges at the cost of overall accuracy. These are great for shotgun sights and work great on rifles. The dot will still allow you to engage targets at long range. As mentioned above, the Eotech brand is the only true holographic sight since they own the patent on the technology. That aside, they also make probably the best series of holo sights on the market. For the money, there are none better. They specialize in only this type of sight and have been making them for decades. Below them, there are a few notable brands. It would be impossible to mention them all Trijicon and Vortex both come to mind. Vortex is the more budget-friendly option but are a little behind Trijicon in quality. Regardless, either of these are an all around good choice for any tactical or hunting applications. Some affordable options are Sightmark, Sig Sauer, and Holosun. They make more of an entry level sight that can be purchased for much less than the top end brands. They are very functional sights with good battery life. If you are on a budget, this may be the place to start looking. Below this, there are dozens of brands that make holo sights costing well under $100. Most of these are not worth considering for any practical use. They lack the shock resistance of higher end sights and can break from recoil alone. Even if they survive that, they are fragile to impacts and often have very low battery life. There is no other place to start this than with Eotech. They are the original and by far the best holo sight on the market. They are consistently the best rated with any of their models but the one that takes the lead is their model 512. Not only because of the quality but it can be had for under $500, making it the best overall value as well. This Eotech was designed for AR 15 series rifles but will perform on most any platform that needs a blend of speed and accuracy. It would not be out of place used for M1A rifles and has become a popular choice for AK 47 fans. No matter what you pick, the shock resistant construction will hold up to the recoil of anything but the largest magnums. The reticle in the 512 is a 68 moa circle with a 1 moa dot. This allows you to get on target very fast at targets under 50 meters while still being able to get a finer bead and take accurate shots out past 100 meters with ease. Of all the sight options available for the modern rifle, this is the most versatile and fastest out there. Expected battery life is 1000 hours+ with 2 lithium batteries. It will shut itself off in 8 hours should you forget. Weight with batteries is about 11 ounces. This is the largest Eotech but also the lowest priced and most durable. It is covered by Eotech’s 10-year warranty should anything happen. While the ACOG is Trijicon’s best-known optic, it is not their only choice. The RMR series of sights is actually intended to be used alongside the ACOG but can be used independently if needed. You will need to get one with the appropriate mount for your use but even the costliest of these are still under $500. The RMR was designed to be used on the AR 15 and pairs well with 5.56 but will also work well for 300 blackout and various other calibers. It can be mounted to most any optic including standard rifle scopes. It can even perform for Glock and similar tactical pistols. Part of this is the bright and easy to see 3.25 MOA dot and part is the very small size and lightweight. It weighs just over an ounce! Trijicon is big on features and built a lot of usability into the RMR. It has 8 brightness settings including 2 that are night vision compatible. Battery life is 4+ years with a single lithium battery. It can even auto-adjust brightness for the conditions you are in and will turn off after 16 hours to save your battery. The RMR does come with Trijicon’s lifetime warranty but it isn’t likely you will need it. Even though it is tiny, it is Mighty! RMR stands for Ruggedized Miniature Reflex and that is exactly what it is. Made of forged aluminum and waterproof, it was made for the demands of the military and should hold up to any use you would put it through. This is the second true holo sight on our list and one that is very exciting for several reasons. Firstly, Vortex is one of the most innovative companies in the shooting market and any of their optics are usually phenomenal. Secondly, it is a completely new holographic technology. Finally, you can get one of these exceptional sights for under $400. Of immediate note, this is one of the smallest fully contained holo sights on the market. It does weight more than the tiny open models but at only 11 ounces, it is still very light. This makes it perfect for any tactical application but it would be considered a great choice for Ruger 10/22 and other small bore automatics. It has even been used for airsoft by some intrepid players. Like all Vortex optics, the Razor UH-1 is built like a tank. The housing is aircraft aluminum while the optical grade glass is shock resistant and coated with Vortex’s Armorteck to prevent scratches. The whole optic is sealed to prevent moisture intrusion, making it both water and fog proof. All of the air has been purged from the scope to make sure it stays this way. The reticle pattern is as novel as their new holographic technology. It consists of a large circle with a chevron on the bottom and a dot in the center. At ranges under 25 yards the tip of the chevron is your aiming point while at longer ranges, you utilize the center dot. This ensures this sight can hit at many ranges with speed and precision. If you are looking for a holo sight, this would be a great one to try. Holosun sights are newer on the market and use a technology similar to the Vortex. They are still trying to establish their market so they are building the best sights they can and selling them for very affordable prices. This is a sight you can have on your rifle for under $300.00. This is one of the best values in a holo sight in today’s market. They start with a titanium alloy housing which is stronger than aluminum and more scratch resistant. This protects the areas of the optic that would usually be damage prone and does it better than almost any other optic company. The housing is shock resistant and works great on most any weapon. You could easily stick this on a shotgun for turkey hunting or your favorite rifle for deer hunting. You can run the Holo sun for a reported 50,000 hours. I doubt this has been fully tested by any objective source yet as that is almost 6 years and the sight hasn’t been out that long. It does use a combination battery/solar system so it could be possible. The only thing that uses power is the LED that powers the reticle. Speaking of which, the Holosun has three options for reticles depending on what you are shooting that day. You can opt for the standard circle/dot reticle used in most holo sights or with a push of a button you can switch to just the dot or just the circle. This is a novel feature that some shooters may like but one that will not matter to most people. Almost everyone is aware of the world-renowned quality of Sig pistols and AR-15s. Their foray into the optics world has been just as successful! They make a wide range of optical devices that have been well received for the shooting community. The Romeo one is among them and perfect for mounting on your AR 15 or stick on your favorite Sig P series or 1911. While the Romeo 1 is a reflex sight with a simple red dot, that doesn’t make it any less of a good sight. The dot size is a decent 3 MOA that allows you to get on target super quick despite the low profile of the sight. It does very well on smaller, lighter platforms but can be used even larger weapons. It is shockproof enough for SCAR 17 and other .308 rifles. Construction wise, this optic isn’t anything special but it isn’t something that you are going to break easily. The body is the standard aircraft aluminum alloy used on most optics. This makes it more affordable while remaining very strong. It is also water and fog resistant for use in adverse conditions. Weighing under an ounce (without battery), this is one of the lightest and smallest sights on the market, coming in under 2 inches in total length. This may be a little small to look right on larger rifles but is high-quality enough to be able to stand up to any punishment. For the price, this is worth considering, especially for those running smaller, faster firearms. Once again, this is not a true holo sight but functions in a way consistent with what people think of as a holo sight. The difference being the reticle as a dot rather than a true holographic display. Still, it is a Vortex product and that is synonymous with quality. Couple that with the very small size and low price tag and you have a great sight! Like all Vortex products, this is likely a little over-engineered but that is what we like to see in the shooting community. It is normal to see an optic of this type with an aircraft aluminum body but taking the care to multi-coat the lenses for clarity is rare. Part of that coating is also the Vortex Armorteck to prevent scratching to the most precious and sensitive part of the optic. The Venom’s dot has 10 brightness levels which is fairly consistent with sights of this type. However, it also has auto-brightness where it will adjust to ambient light levels on the fly to ensure you always have a clear view of your impact point. This feature does exist on other sights but only the more expensive models. None exist on an optic this affordable. You can get up to 30,000 hours of run time off one CR 1632 battery on moderate settings. The Viper does feature an auto-off in case you leave it running. This may seem a little light on features but most of these optics are. Simple or not, it will get you shooting faster and more accurately from the first time you use it. Rounding out the end of our list, Sightmark is a true holo sight and the cheapest one currently available. While Sightmark is not a notable company and has never been a fan favorite, their products are actually quite good. If you want true holographic technology on a budget, there is no beating this sight. It comes in under $150.00 if you shop around a little. For that price, you will have to forgive a few potential problems but not enough to affect most users. The one bad mark this sight has is the frame. Rather than the more common aluminum, Sightmark as opted to use a cast magnesium. This is not as strong or damage resistant by any means. It is lighter than aluminum but, once again, it isn’t enough that most people will notice. If you can get past that, this is a very good quality sight. The reticle pattern is the familiar circle/dot that is most common with holo sights. It does have 1 hour shut off and can run for over 1000 hours. It has 6 brightness settings including one that is night vision compatible. Sightmark has been attempting to get their products in the law enforcement and military for years now but has yet to succeed. Construction is quite good and the optic is rated to be shockproof up to a .50 caliber rifle. While that is good to know, it is unlikely to ever be the case. This sight just lacks the water and fog resistance that most holo sights but for a clear weather gun, this is a solid choice for most people. While we may not have featured only true holographic sights, we have attempted to keep the functions of the sights consistent. Once you know the platform you will be running with the best holographic sight, you are ready to make a choice. Most, but definitely not all, will work for a number of different platforms. As a tactical tool or even for the hunter, any of the optics above will be very hard to beat. They are fast, accurate, and very easy to use! This is a great way to improve your weapon without the need to spend a ton of money.